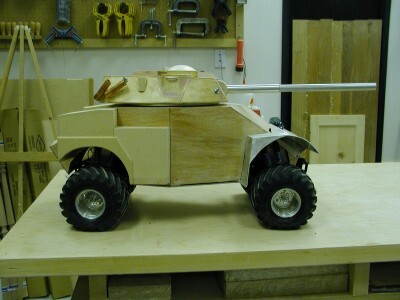 Built: April, 2003 Armor: ??? The hull takes form, showing the distinctive fenders of this design. 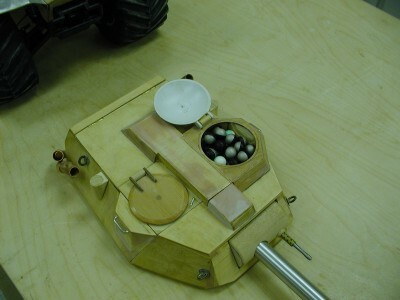 A lazy susan is installed on top as a base for the turret. The hull and turret are fitted together and it's starting to look like an armored car. No chassis, suspension or motor yet, but that will come later. 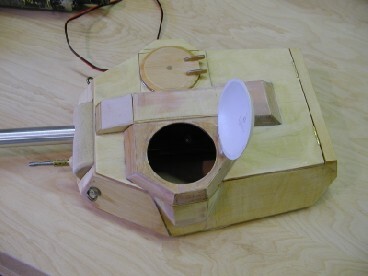 The turret is made from plywood and plastic, showing some nice detail. 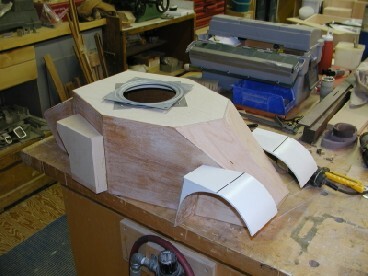 The bottom of the turret has a square recess to accept the top of the lazy susan, giving a nice low-profile to the assembly. The marker required slight modification only thanks to going to school on Steve again. Instead of filing the sear I just shortened the spring and removed the return spring behind the trigger to overcome the excessive trigger pull. The barrel however was another story. As purchased the marker barrel is only about 8" long and the bore was appalling, full of pitting and pock marks from the casting. I found the perfect barrel material, a 3/4"OD extruded aluminium tube with an inside dia of .680 and had a machinist friend of mine bore out the marker barrel and epoxy the tube in place, a little polishing and a straight,light,strong barrel was done. The turret is built so that the entire marker can be removed in seconds for cleaning if required. The two forward lifting rings on the turret are actually the pinions for the mantlet and when pulled allow the entire marker mantlet and all to be removed( barrel removed). 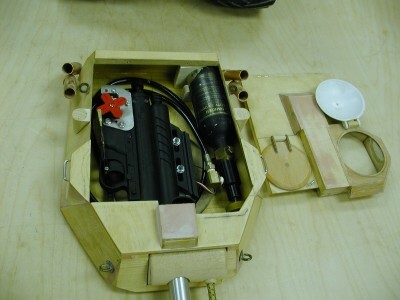 The turret houses the CO2 cylinder( 3 1/2 oz) and the 40 round magazine is loaded through the commanders hatch. 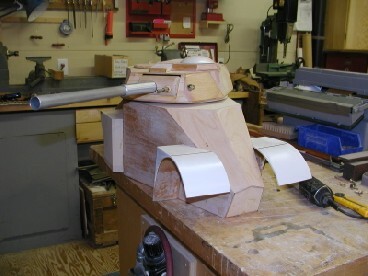 At present there is no elevation mechanism as height in the turret is minimal but I haven't given up on it yet. The turret rotate is in the works and will most likely consist of a rubber roller running on the inside of the 6" lazy susan bearing. 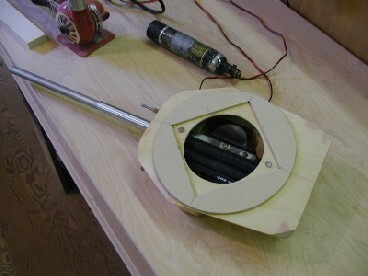 The turret is held on using a round 1/4" MDF plate with a square cut to fit the lazy susan and 2 rare earth magnets recessed in the turret bottom as a latch. 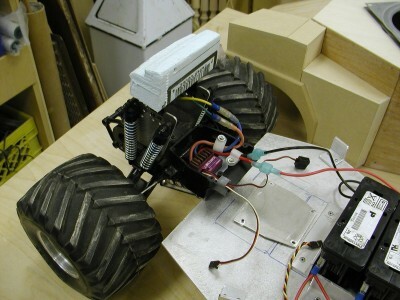 Power is supplied through 2 x 6v 2.5ah batteries in parallel and although at present ther is only 1 motor thus 2WD the plan is to add a second motor for 4WD. Thanks to Joe Sommer I was able to get what has turned out to be pretty much the ideal chassis. 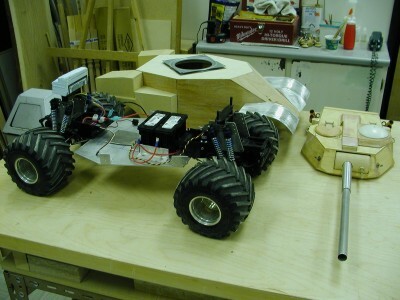 A Kyosho monster truck, electric motor,ESC and steering servo all put to good use. Having a little hitch with the ESC but we will get that sorted out soon enough. Due to the increased weight of the body over the original truck I had to make a few mods but it looks like it might work now. The original shocks were spring and air only, so a new set of oil filled were added, however these still could not support the weight so I added heavier springs and hopefully they will do the trick ( as yet untested due to ESC). The original steering servo (due to weight) also had to be replaced with a high tourque servo but functions well as the trigger servo. With all the parts together, it finally looks and rolls like an armored car.